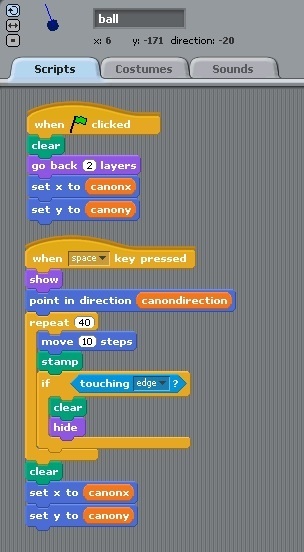 This diagram below shows you the key areas of the Scratch software interface. 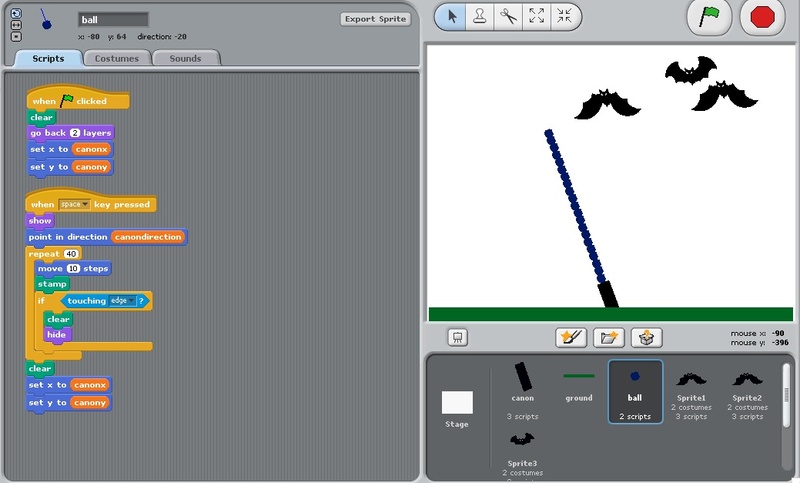 But let's actually use an example, made in Scratch to illustrate what the items are above. Don't forget to click the blue "see inside" button to get a look at how the code is laid out. 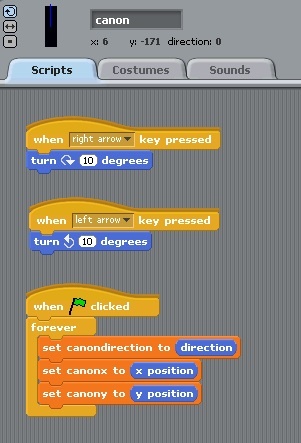 Now that we have had some time to explore Scratch. Here is your first simple assignment. 2. 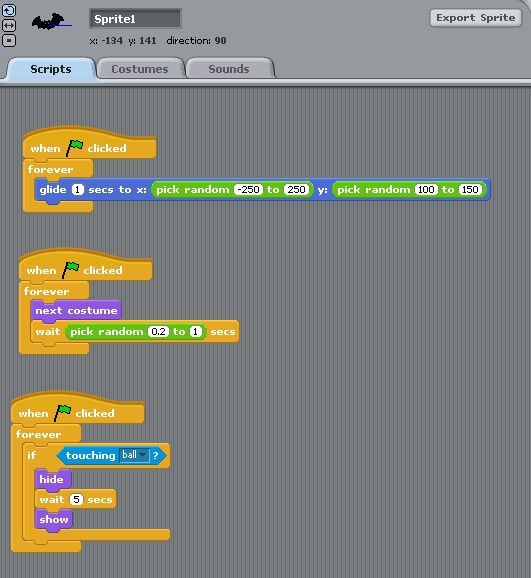 Create a Basic "Pong" Game. Get creative with your sprites. They don't just have to be a ball and a paddle. 1. Game must have a main character that the user moves about the screen using the arrow keys on the keyboard. 2. There must be "food" that the character eats. The food will disapear after the character eats it. 3. The game area must have a maze that the main character must "bounce" off when it touches the maze. 1. The game keeps score based on the number of food eaten. 2. Ghosts or evil characters chase the main character. 3 System for keeping track of the lives of the main character. How to make your character not go through walls. 1. Must have 2 different dancers that use costume changes to simulate movement and dancing. 2. Must have music that plays while characters are dancing. 3. Must have a system where the user clicks on a green or red light sprites to start or stop the music and dancing. 1. Use photographs of yourself to create dancing sprite. 2. Add sprites that simulate colored lights changing on the dance floor. 3. Use different stages to change the setting of the dance floor. *hint: this is a great chance to incorporate yourself into a game. 2 or 3 digital photos of yourself, edited in photoshop can make your game totally unique. Make your sprites interesting and creative. Extend your project by attempting to create actions like changing backgrounds, flashing screens, explosions if a sprite dies, etc. Play a classic example of a target shooting game, the 1979 Epic Battle known as Galaga! For your final project you will create a side scrolling game. This will be a 1 or 2 person assignment. Work in pairs to share ideas and develop an exciting game. Your game requires a main character sprite. Your game requires 1 end boss. Your game requires an intro screen with text describing how to make the game work, i.e. "push spacebar to start, left & right arrows to move, M key to shoot"
Your game requires an end screen to indicate whether you win or lose. The following link are all tutorials and examples of how to create this project. Look at other examples, analyze the code, figure out how to create what you have in your imagination. 1. What was the first video game you remember playing? 2. What was your favourite video game as a kid? 3. What game were you best at as a kid? 4. What video game have you ever felt most "addicted" to? 5. What made it so good? 6. Why did you feel like you could not stop playing it? 7. How has the type of video game you like changed over the years? 9. What is your favourite platform for playing video games? 10. Where do you see video games going in the next 5 years? 11. 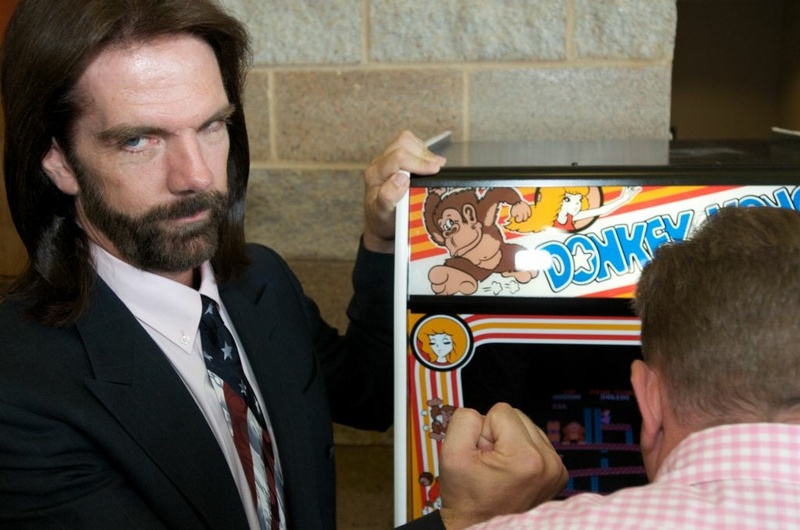 What are the key factors behind a good video game? 12. What are 3 other games you love and why? 13. If you were to design any type of game you could, describe it in 75 words or less.